I was recently invited to prepare comments for the opening of the second workshop of the EU’s important cultural landscape project (HERCULES) held in Amsterdam in late September. As a member of its advisory board I was charged to give inputs that would both reflect on European cultural landscapes while also offering an outside and hopefully thought-provoking perspective. Diverse connections of the ecology, social functions, and political economy of food and cuisine to cultural landscapes are the core of these comments. The cultural landscapes of food and cuisine in today’s Europe are remarkably resilient, while also dynamic and rapidly changing. Transformative land-system influences include the new interplay of the above-mentioned heritage foodscapes and those of the continued consolidation of large farms. Broadly related factors include the growth of cities and urbanization, urban diets, and expansion of the periurban spaces of production and consumption. Add to these changes the diverse new roles of growing numbers of self-proclaimed “foodies” along with the populations of immigrants to Europe, both new and more established. Globalization factors play a major role in changing foodscapes, not only in the EU but in examples occurring worldwide. The forces of globalization, such as international trade and migration, offer plenty of examples of these connections. The broad range of today’s foodscapes occurs in the context of similarly pronounced diversity of global cultural landscapes. Issues of social justice and equity are increasingly embedded in the cultural landscapes of food-growing and consuming. I work on projects with land users and food systems in organic and conventional dairy of the Upper Midwest and Northeast of the U.S.A. and in the foodscapes of Andean potatoes and Andean maize in Peru and Bolivia. Living and working amid the everyday activities of people in these cultural landscapes has impressed me greatly. Growers and those who work in cooking and preparation of foods, along with the practices of consumption, are constantly creating, and actively re-creating, vital cultural landscapes through their knowledge, skills, and hard work. At the same time, these foodscapes are very special ones. 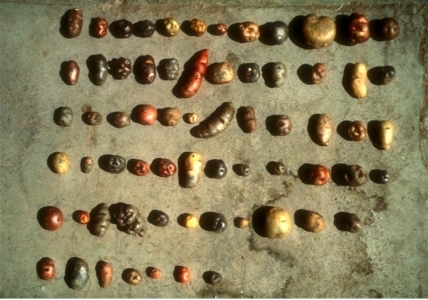 In the case of Andean potatoes in western South America, for example, growers and consumers from Colombia to Argentina grow approximately 4,000 different varieties or cultivars, often referred to as landraces. Each landrace is visually distinct and separately named, often in Quechua, Aymara, and other indigenous languages, as well as in Spanish. The growing of Andean maize and its food systems are also extraordinarily diverse while they too can be managed to fit current circumstances. These dynamics, such as the roles of non-traditional social networks, are linked in new cultural foodscapes to such important current tends as migration and intensification (Zimmerer 2013, 2014). Experiences such as those mentioned above guide my reflections on EU foodscapes. I’m inclined to consider both the quintessentially European and the connections within and beyond conventional boundaries in such cultural landscapes. Various traditional European foodscapes and customs are alive and well in a growing number of projects, even as accelerating change occurs in land use and culinary practices. At the same time, the outward looking view of new and ongoing changes in these cultural landscapes must focus our attention equally on such corresponding social issues as food security, social justice, and equity.